By now, I’m sure you guys know how much I love Epcot. If not, here’s the gist: I love Epcot with my whole heart, I want to live there forever, there’s no greater sight than that beautiful ball lit up at night. Got it? Cool. Last year, due to my anxiety, I wasn’t able to make it to Epcot (cue tears) but thankfully this year I’m feeling better than ever which meant is was Epcot time for me!!! We were extremely lucky as we managed to get fairly last minute reservations at Les Chefs de France, my fav restaurant in Epcot (maybe even in all of Walt Disney World??). So as soon as we walked through the park gates, we hightailed it on over to the restaurant and we were very quickly seated. Obviously, I ordered the Boeuf Bourguignon which is the tastiest meal. And I even got to see my fav waiter who served my boyfriend and I when we went in August!! If you’re ever dining at Les Chefs de France and you’re served by Kevin, you’re in for a treat - he’s the sweetest EVER. After dinner, we went on one of my fav rides, Frozen Ever After, and then took a stroll around the World Showcase to see all the beautiful holiday decorations. Epcot is so interesting during the Festival of the Holidays, their special holiday celebration where each country pavilion showcases their own cultural way of celebrating! Each pavilion is decorated so beautifully for the season, it’s such a sight to take in! I highly recommend strolling around and peeking into every pavilion - you won’t regret it. After we walked the entire pavilion, we - of course - went to Mouse Gears, one of the best Disney shops. And then grabbed a Starbucks for the journey home. I actually managed to grab a Peppermint Mocha Frappucino, which I’d never had before but I’ve tried when my boyfriend has ordered. I LOVED it. So festive and delicious! I wish the holidays weren’t over so I could have another haha. See you in a couple days for the next day of my travel diary! If you haven’t already read my first travel diary post, give that a read here first! I truly believe that the most magical place to be at Christmas time is the Magic Kingdom. Everything is just so enchanting there during the holidays! Not a single piece of Main Street isn’t adorned with beautiful wreaths or garland, and there’s just a really homey feeling in Town Square. If I could live on Main Street throughout the month of December, I’d be the happiest gal out there! So, it goes without saying that my favourite day of our Christmas trip is always the day that we go to check out the Magic Kingdom festivities! The very first thing we did when we arrived at the park was, of course, take in the beautiful sights. I got a million pictures of all the decorations, but I think my favourite is of the Fire Station! Everything is so beautiful at Christmas, I wish they could keep the decorations up year-round (except for at Halloween time, of course). We also took a little dip into the Main Street Emporium shop. They have sooo many new items in stock and I wanted to buy it all!! My dad ended up buying me the Mickey’s 90th Birthday ears which was extremely exciting because I didn’t expect them to still be available. During Christmas time, the parks can get extremely busy. It’s one of the busiest times to visit, along with July 4th and Thanksgiving. For someone with anxiety, that can mean it gets pretty hectic, especially when waiting in queues upwards of 120 mins. So I prefer to just stroll around the Magic Kingdom, take my time in letting it all soak in, instead of rushing from ride to ride. We did get a couple of Fastpasses, including ones for Big Thunder Mountain and Haunted Mansion - two of my faves and pretty impressive scores considering their popularity! But aside from that, we just wandered and took in the sights. Personally, I found that much better than doing all the rides. As I have an annual pass, I can come at any time of the year and do rides. But during Christmas time, I’d prefer to see the decorations and relax. If you haven’t ever been on Jungle Cruise during the holidays, then definitely add it to your bucket list because it is SO FUN! I already love Jungle Cruise enough on its own… But add a Christmas overlay to the ride and my love can only grow! The “Jingle Cruise” overlay adds a ton of festive decorations throughout the ride, as well as a bunch of Christmas-themed jokes told to you by the beloved Skippers. This classic ride is a must-do for me during the holiday season, so I always make sure to grab a Fastpass for this one as the queue can get quite long during the holidays (as do most ride queues during this time!). Last, but certainly not least, we obviously had to see the Frozen Holiday Wish, where Elsa lights up Cinderella’s Castle with her magic ice powers!! The Dream Lights are the most beautiful thing in the park during the holidays. I’m always in awe whenever I see the castle lit up in shades of blue, pink, and white, no matter how many times I’ve seen it before. The show itself is also extremely cute, especially if you’re a Frozen fan like myself! We decided to head out of the park shortly after the show (as my boyfriend was battling a cold) so it was the perfect way to end the perfect day! Hello friends! Merry belated Christmas. If you haven’t been following along with my Instagram stories (shameless plug rn, follow me at @bookishbrunettegal) then you may not know that I’m currently away in Orlando on my annual Christmas family vacation! Our Christmas vacation is one of my favourite trips of the year. It’s full of festivities, and magic, and beautiful lights! So, I thought I’d bring you all along with me on my trip with some travel diaries! Starting off with our very first day on the trip, December 26. Our vacation was set in motion by one of my favourite new traditions, the Boxing Day brunch. For the past two years, we’ve had brunch on our first day at the Grand Floridian Cafe, which you probably know is my favourite brunch on Disney World property. This year, we got to sit out on the patio which probably because of how massively packed the restaurant was. Our reservation was at noon but still there were plenty of people waiting to be seated. Having our meal outside was sooo nice. The weather was absolutely lovely and we had such an amazing time. As usual, I ordered the traditional eggs benedict with a cup of coffee and it was delicious!! After brunch, we embarked on another one of our beloved Christmas traditions: the monorail resort hop. On Boxing Day, we love to go around to all the monorail resorts and check out their Christmas decorations, starting at the Grand Floridian. I already adore the Grand Floridian. But I love it even more at Christmas time. The decorations are so beautiful and delicate. 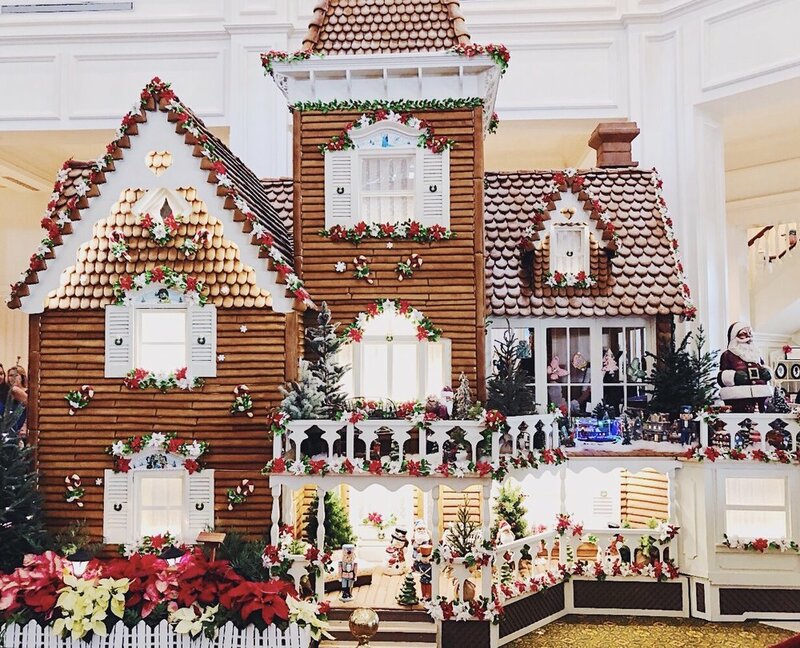 They have a number of Christmas trees, including their massive showstopper on the main floor of the lobby, and of course, their famous Gingerbread House. This year, I actually remembered to buy a gingerbread shingle which you can actually buy at the counter inside the Gingerbread House. Unfortunately though, the line at the Grand Floridian was huge so I got my shingle at the Contemporary Resort later on in the hop - which is a good tip for anyone who doesn’t want to wait in a massive queue! Our next stop on the monorail journey was the Contemporary Resort. The Contemporary, unfortunately, isn’t a huge stop for decorations because of the monorail track through the middle of the resort. There is a huge tree outside of the resort by the road, but you basically have to stand in traffic to see it. So that’s not really an option. They do, however, have a really cute gingerbread set-up based on the Cinderella characters in the lobby. This is where you can buy a bunch of festive treats, like the gingerbread shingle!! Definitely a good alternative to the Grand Floridian shop in my opinion. You can also go through the number of gift shops at the Contemporary while you’re there which is always a fun time! Lastly on our resort hop was the Polynesian Resort! I loooove the Polynesian. It’s so pretty and tropical, and like the Grand Floridian, has a ton of trees of different sizes throughout the lobby. Idk I just think the Polynesian looks extremely cute dressed up in her Christmas decor!! My mum also loves visiting the Polynesian because it means rooting about the gift shops for Lilo merchandise. Why is it that there’s always Stitch merch but never Lilo?! So disrespectful. A neat fact about the Polynesian is that it is one of the places on WDW property that sells Dole Whip!! If you’ve ever waited in line for Dole Whip in Magic Kingdom, you know how long it can take as so many people are always queued up at Aloha Isle. But at the Polynesian, there’s usually a minimal line! Just pop on over to the Pineapple Lanai. Enjoy your treat!! After we finished our grand tour of the monorail resorts, we headed on over to Disney Springs for a little bit of shopping. As I hadn’t been to the parks since October, I missed the opening of the new reimagined World of Disney shop so I was extremely excited to check that out! What did you guys think of the new World of Disney? Personally, I miss the old character-heavy design, but I think that the renovation has made it a lot more roomy and open, which makes it a lot more manageable during the heavy season (like Christmas time!). Luckily, I found the Christmas spirit jersey there which I was sooo happy about because I hadn’t seen it anywhere on our resort hop. We popped into a few other shops, namely Zara and my absolute fav, Uniqlo where I bought the most beautiful, cozy sweater EVER!! Afterwards, we went home and ordered some pizza. It had been a long day, especially after a pretty gruesome travel on Christmas Day. So, that’s all for our first day! I’ll pop back in soon to share our other adventures in another travel diary post! What did you guys get up to on Boxing Day? I really do believe that no one does the holidays better than Disney does. Christmas is sososo beautiful in the parks. They drown everything in sparkly lights and there’s just a really cozy feeling in every inch of the parks and resorts. As my family visits Walt Disney World every year for Christmas, we’ve been lucky enough to do a bunch of different holiday-themed experiences. So today I thought I’d share my absolute faves with you guys! So without further ado, let’s get right on to it! One of my all-time favourite holiday traditions in the parks is taking a trip around the monorail resort loop and seeing all the beautiful Christmas decorations!! I think this is probably one of the best free holiday activities in Disney World that I consider an absolute must-do every year. If you park at Magic Kingdom, you can hop on the resort monorail and visit all 3 resorts around the Seven Seas Lagoon. Every resort has it’s own unique decorations, complete with a giant Christmas tree themed to the resort. They’re all so beautiful and photogenic! In the past few years, my family has chosen to do brunch at the Grand Floridian Cafe and then we head around the loop which is a really chill and fun way to do it. Although this is technically a part of the monorail resort loop, I think it’s worth mentioning separately. The Gingerbread House is phenomenal!! Boasting 5,089 gingerbread shingles, this is an absolute monstrosity made out of gingerbread and other sweets. Honestly, when else in your life are you going to be able to see a giant house made out of gingerbread? Probably never, right? Not only can you take adorable pics of this beauty, but you can also buy the edible shingles to take home and try for yourself which is really cool. I completely and utterly love the Magic Kingdom Christmas parade so much!! I haven’t been able to see it every single year unfortunately but this year, I’ve specifically set aside time to go out and see it which I’m very excited about. It features all our favourite Disney characters in their festive winter garb along with a few Christmas favourites, like toy soldiers (my faves), reindeers and Santa Claus himself!! Guys, there’s not much I love more in this world than Gertie in her Santa hat!!! Like how freaking cute? They’ve really put a lot of work into amping up the decorations in Hollywood Studios over the past few years and I’ve been absolutely loving it. Last year, we tried to take it all in but unfortunately it was absolutely FREEZING (I had to buy a sweater and a blanket to wear around the park lol). But this year, we’re going to go out and see them properly. They’ve also added some decorations to the new Toy Story Land so I’m excited to get my first look at those! Y’all probably know by now how much I love my Epcot festivals. There are so many incredible experiences at Epcot during the holiday season. You can try a bunch of holiday food delights from different countries, hear how cultures celebrate during the holidays, and see the Candlelight Processional which is a really incredible experience that’s hosted by celebrities through the end of November and the month of December. I think that the cultural aspect of Epcot is one of my favourite aspects of the park, and Christmas time really reflects that. What’s your favourite Walt Disney World holiday experience? To view a list of all my Blogmas posts, click here. It’s the mooost wonderful time of the yeaaaar!! That’s right, friends. It’s time for my annual write-up on Mickey’s Not So Scary Halloween Party! If you’ve been here for awhile, you’ll probably know that I’ve been to Not So Scary twice before - once in 2015 and again last year. I absolutely love the party and I love writing these posts, too. It’s sort of like reliving everything all over again to me honestly. So, without further ado, let’s jump in. If you’re interested, you can read my prior posts about Not So Scary from 2017 here. You probably won’t be surprised to hear that I love Halloween at the parks. I’m sure I’ve said it a dozen times before, and I’ll say it another dozen times in the future. Disney really does everything better, especially the holidays. And Halloween gives them an opportunity to bring out some of the less popular characters. They also decorate the parks to the nines, with giant pumpkins everywhere, and bales of straw and other harvest-themed decor at every turn. If you love a good Jack O’ Lantern, look no further than Main Street U.S.A.! If you’ve never heard about Mickey’s Not So Scary Halloween Party, you’re not alone. Until I went in 2015, I hadn’t heard much about it either. In the past few years, it’s been gaining more attention and popularity, but back in the day it was this super mysterious exclusive party that I never really knew much about (especially because I didn’t visit Disney in the autumn). Basically it’s a ticketed event held at Magic Kingdom on select nights from late August to Halloween, where you can go in ‘after hours’ and experience a bunch of attractions, rides, and shows that are Halloween themed. There’s also a massive dress-up component, as tons of people (myself included!) dress in costumes. Where else do you really get to do costumes anymore when you’re an adult?? The event starts at 7pm, so we got there about 6:30pm. At that point, cast members were desperately trying to control the crowds, getting the non-party guests out of the park and the party guests into the park, without causing too much of a commotion. We entered the park with our Magicbands as usual and then immediately got our wristbands for the party put on. If you’re already in the park when the party starts, there are stations set up all over where you can get your wristbands, too. Once we had our bands, we went onto Main Street and got to pose with this super cute car before going ~backstage~ to make our way into the party. Initially, my boyfriend and I had decided not to do costumes this year. All summer we tried to figure out what we wanted to dress-up as but couldn’t decide on anything and when we did, the costume idea fell through, so we just gave up entirely. But then, about a week into September, I got the idea to do a Mary Poppins and Bert couples costume. We completely (and somewhat frantically) DIY’d our costumes, searching the depths of the Internet for pieces to put together (I’ll do a post on our DIY later!). I’m sooo happy with how our costumes turned out!! We had a few tiny last minute glitches but in the end it all worked out and the costumes were actually super comfy throughout the night thank god. Although we didn’t get to experience everything that Not So Scary has to offer, we did get to see and do so much. Of course, we took part in a little bit of trick-or-treating as usual. My family likes to go to as many trick-or-treat stations as possible, and then bring all our collected candy home to handout to kids on Halloween. Making the most out of the cost of our tickets haha. We also got to see a bunch of the shows that are what make the party so incredible, in my opinion. One of my all-time fav parts of Halloween as a whole is Hocus Pocus. And luckily for me Hocus Pocus is a big part of Not So Scary! They put on a show at the stage in front of Cinderella’s Castle called Hocus Pocus Villain Spelltacular. It has the Sanderson sisters, as well as a bunch of other Disney villains. And, of course, the performance of I Put A Spell On You always completes all my childhood dreams!! Honestly, the Sanderson sisters are the queens of Halloween and you can’t tell me otherwise. Also, please check out that picture of the Hocus Pocus fireworks from behind the castle that I took while walking. Ugh I love. 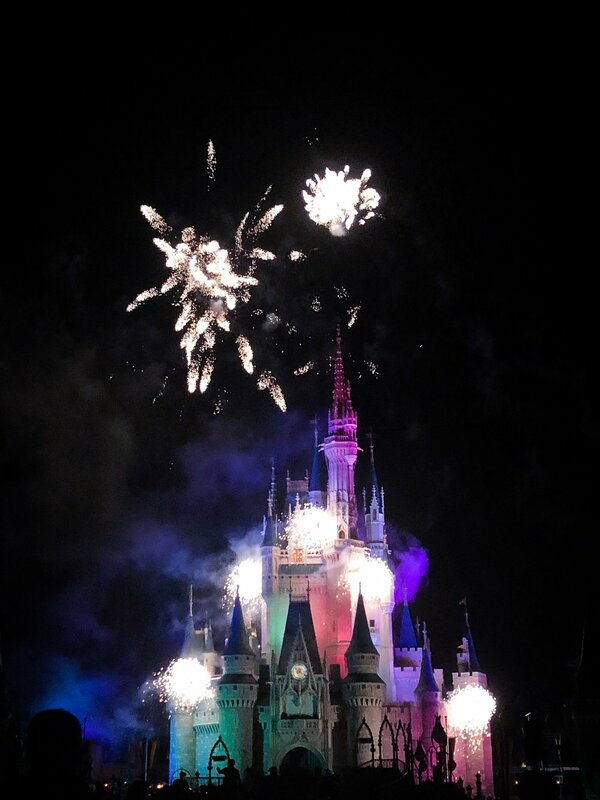 I would be completely remiss if I didn’t mention my beloved HalloWishes fireworks! As you may know, the Wishes fireworks went away early last year which was devastating to all. But luckily, we still have a part of that old magic during the Halloween and Christmas holiday seasons! I absolutely love HalloWishes. I think that the different effects on the castle, the fireworks, and the music are all so incredible. And, last but certainly not least, we got a chance to see my favourite Disney World attraction of all time: Mickey’s Boo To You Halloween Parade. I LOVE THIS PARADE!!! Absolute best parade of all time. There’s literally nothing about this parade I’m so-so on. I literally love every single part of this parade. The soundtrack is DIVINE. The whole Haunted Mansion part is sooo amazing. Especially because I absolutely love Haunted Mansion and everything related to it. I highly recommend carving out time to see this parade if you go to Not So Scary (it runs twice a night). The only bummer of the party this year was that the Headless Horseman, who usually rides out in front of the first float, didn’t show up! Because of the rain, it wasn’t safe for the horse or the rider. So that was pretty disappointing however we totally understood that it just couldn’t happen. Hopefully next year we’ll see him again!! Have you guys been to Not So Scary before? What’s your fav part! Today, I thought I’d do a review of the Epcot International Food and Wine Festival, and chat about the things I tried this year. I’ve done this in the past on two different occasions and I just love writing about the festival because it’s really a lot of fun and reminiscing about food is always a good time. If you want to read my past Food and Wine reviews, you can! I wrote one up in 2015 (when I still a baby & v new to blogging) and in 2017. The very first thing we did on our Food and Wine tour this year was ride Spaceship Earth. I don’t know if you guys heard, but it was announced on a bunch of blogs recently that Spaceship Earth will be undergoing a two and a half year refurb which will essentially change everything we know and love about this ride, in preparation for the brand new shiny Epcot 2.0 that Imagineers are cooking up. I immediately panicked when I read the article because basically every Disney ride or attraction I’ve ever held near and dear to my heart has been given the axe over the last 5 years and Spaceship Earth is my absolute fav ride. I’m cautiously optimistic about what this refurb will actually consist of - maybe it’s just a refresh?? But for now, I’m going to ride it as much as I possibly can before it closes down. As my family are AP’s, we usually stop at the Festival Welcome Centre right off the bat to collect our free Passholder gift and the Festival passport. The Welcome Centre is located in the old Wonders of Life pavilion, which is super cool because I never visited Disney when the pavilion was in operation so it’s a bit of a glimpse of what Epcot used to be. This year, the AP gift was a magnet with Mickey in a chef hat that is absolutely to die for. Like, c’mon how cute is that!!!! They’ve also been giving out cutting boards if you go multiple times. Our very first stop for food was the Hawaii booth. As usual, I got the Kalua Pork Sliders. The weird part of my love for the pork sliders is the fact that it’s the exact sort of dish I’d actually hate in most cases. First off, I typically don’t like pork. Second, it’s got a sweet-and-sour Dole pineapple chutney and spicy mayo on it. I’m the pickiest eater ever so this seems really ‘out there’ for me but good god do I love it. The second stop for me was my home and native land! At Canada, I always get the Wild Mushroom Beef Filet Mignon. It’s kind of an iffy dish for me. Some years I love it, some years I could do without it. This year, it was pretty good actually. I feel like it was a lot smaller than last year?? But I could be misjudging the size. And although I like the taste of mushrooms on the steak, I’m not huge on mushrooms themselves and there were a ton on top of the beef this time so I was constantly pushing them to the side. But the meat was very tender and well-done, just how I like it. I also tried the Canadian Cheddar Cheese Soup which is what my mum ordered. I loooove me some cheese soup, especially because it comes with a pretzel roll which you can dunk into the soup. YUM. I also had, for the second time ever, the Schinkennudeln from Germany. There will never be a year where my family doesn’t pronounce this completely wrong but the four of us love it all the same! It’s pasta gratin with ham, cheese, and onions that’s soooo delicious. It looks like it’d be a really heavy pasta from all the cheese, but I find it’s actually quite light which is good because I don’t love heavy pastas. Plus, the cheese is very mild - again a good thing because I’m not big on sharp cheese (I know, I’m so weird). Ladies and gentlemen, may I draw your attention to the worst quality pic of the entire post! By this point, it was like 7:30 at night so lighting was not on my side. ANYWAY. This is one of my fav foods of the whole festival, the Loaded Mac n Cheese. Ugh this is so good, I’m in heaven just thinking about it. Again, it’s one of those kinda dishes that seems like something I’d hate. It’s got pepper bacon, cheddar cheese, green onions, and peppers all mixed in with macaroni pasta to make an absolutely incredible (and quite spicy) dish. This and the pork sliders might just be tied for #1 in my opinion. Honestly, Food and Wine is such a great time. It’s a great opportunity to just stroll around World Showcase, taste a few international dishes, and enjoy the atmosphere of *ahem* the greatest Disney park. Hope you guys enjoyed reading! If you’ve been to Food and Wine before, let me know what your fav dish was in the comments. Staying at a Disney resort is an incredible experience. Everything from the resort grounds to the restaurants to the hotel rooms, there is magic sprinkled everywhere. But with so much ground to cover, staying there for the first time can be a bit daunting. So today I thought I'd give a few tips I've learned from staying on-property over the years! One of the best parts of staying on-property at Walt Disney World is that you have access to the Disney Transport. There are a ton of different ways you can get around the parks - buses, ferries, monorails, and even Minnie Vans. Using the buses to get from resort-to-park, or vice versa, is so so simple. We drove to the resort with our own car but decided against driving around and instead using the transport provided and it was so worth it. The buses are quite efficient as they know the quickest routes around property. An added bonus is that you get to bypass the Transportation and Ticket Centre which, if you've ever driven to Magic Kingdom, you'll know is a nightmare. You may already have the My Disney Experience app if you've been to the parks before, but if you haven't been in awhile (or ever), then here's the gist. The app lets you do basically anything you'd ever want - look at maps, check wait times, book FastPasses, make dinner reservations. It's extremely useful and the fact that you can pull it up whenever you want on your phone with the in-park WiFi is incredible. Sometimes I can't even remember the days of going to grab paper FastPasses from the ride queues - remember when only a few rides had FastPasses?! Crazy stuff. This might actually be crucial, especially if you're planning on spending a good amount of time on-property. The refillable mug costs $18.99 for the initial purchase and then you can use it however many times your little heart desires without extra cost. If you're on the Dining Plan, you can even get the mug included in your plan! It's perfect for grabbing a cup of coffee at breakfast, or a few drinks if you're going poolside. I filled mine up dozens of times during our six-day stay and it was well worth the cost. Definitely saves you from waiting in lines for drinks all day long! Staying in the parks, it's easy to rack up a pretty hefty bill from all the food and merchandise buying - especially if you're just charging everything to your room through your MagicBand. Using methods to get discounts makes a big difference! I bring my Annual Pass with me everywhere, just in case I want to buy something and get that 10-20% discount. If you have a Tables in Wonderland card or a Disney Dining Plan, those will also really help you with saving a buck or two throughout your trip, so you should look into those! I cannot stress enough how important this is. Take it from someone who didn't bring bug spray - you need it!! Especially in heavily vegetated areas (which is 99% of Disney, let's be honest). In just one night of walking around Port Orleans, by the river, I got at least six mosquito bites. UGH. Make sure to pack some bug spray in your luggage and also, some After Bite juuuust in case. Better safe than sorry, am I right? What are your top Disney resort tips? As you probably know if you've been following my Instagram or read my latest blog post, I recently spent time in Walt Disney World, celebrating my 20th birthday (which you can read about here). While I was there, I got completely pulled into the merchandise trap which is pretty much the least surprising thing ever haha. So I thought I'd share with you guys some of the things I picked up! Pumpkin Antenna Topper - When I first arrived in Disney, they had just put out all the Halloween decorations and merchandise around the parks. On our first day there, we went to Disney Springs and I found myself in Halloween HEAVEN. The first thing I picked up was this adorable pumpkin Mickey antenna topper. Currently, I have a regular Minnie Mouse topper but I thought this would be a cute change for the fall season. On the back of this topper, it says 'Hey, Pumpkin' which is just the cutest thing ever!! I literally can't wait to pop this on my car. Mickey Ghost Mug - The other Halloween thing I bought while I was at the parks was this incredible Mickey mug. How cute is this?! It's a ghost Mickey and on the back it says 'Boo To You'. I already have wayyyyy too many mugs but honestly, this was a necessary addition to my collection. I love all things Halloween themed and they had an amazing variety this year. It's getting me so excited for the Mickey's Not So Scary Halloween Party in October! Journal - I hemmed and hawed a lot before deciding to buy this journal, but it was one of the best purchases I made. This beautiful hardcover journal is covered in retro-looking Walt Disney World logos and designs and has Mickey silhouettes on the pages. I picked this up after deciding that I wanted to keep a journal of all my Disney stays as a memory book. This was the perfect pick, in my opinion, and I can't wait to get writing! Starbucks 'You Are Here' Hollywood Studios Mug - I'm sure you guys have seen the You Are Here mugs at Starbucks before, they're pretty popular and usually have a city/state/province on them with a cute lil design. Starbucks has a Disney World collection, as well as a Disneyland collection. I already have the Epcot and Magic Kingdom mugs, so I picked up the Hollywood Studios one this trip - and now I've only got the Animal Kingdom one left, and then I've got the entire set! Rose Gold Phone Case - I fell in love with this the moment I saw it. Rose gold is my favourite and this is no exception. This bad boy has a little clasp on it and opens up to be a wallet with a few card slots as well as a window one, which makes it perfect for holding my Disney Annual Pass and my i.d. for getting discounts in the park. And, of course, it holds my phone. Hooray for multi-purposeful pretty merch!! New Fantasyland Mystery Pin Pack - On my birthday, I decided to treat myself to this adorable mystery pack. It comes with two Beauty and the Beast themed mystery pins, which are themed to the Beauty and the Beast area of the New Fantasyland at Magic Kingdom. I got the pin of Belle walking away from her house while reading (which I unfortunately already own) and the three Bimbettes sitting in Gaston's Tavern. They're super cute!! Can't wait to add them to my collection. Haunted Mansion & Halloween MagicBands - Last, but certainly not least, I picked up these two lovely MagicBands! The Haunted Mansion one has a Ghost Host uniform on one side and Ghost Hostess uniform on the other! The Halloween one is decorated in a few of the characters dressed for Halloween, some ghosts and candy, and an orange castle! Hello, everyone! Been awhile, huh? Sorry to have disappeared. If you've been following my Instagram stories, you probably saw that I mentioned I'd be taking a bit of a hiatus from the blog as I was on a week-long staycation at Walt Disney World. Crazy stuff, right!! We stayed, once again, at the Port Orleans French Quarter resort. I've stayed at the French Quarter four times now and will keep coming back without a doubt. I absolutely love it. It's my favourite moderate-level resort by far. I love how small it is, how no matter where your room is located the lobby & restaurant are only a few steps away. 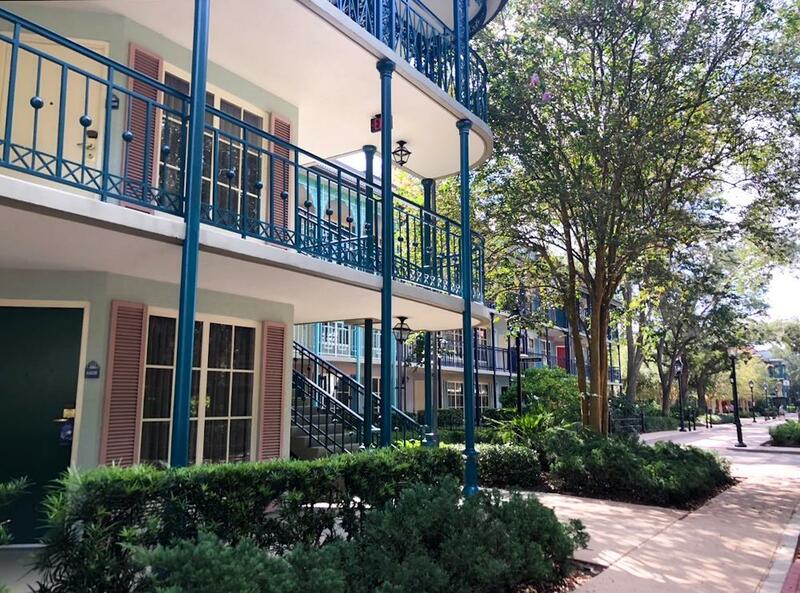 The style of the resort is also amazing - the historic French Quarter style with cobblestone walkways, Mardi Gras decorations, and beautiful bursting colours is so pretty. And they even have horse-drawn carriages! How cute is that?! We stayed in two different rooms during our stay, because we extended our trip after we arrived and our first room wasn't available the entire length of our trip. But we were lucky enough to have both rooms in the 6th building, with a view of the man-made Sassagoula River. Although the rooms don't have balconies, the sights from the windows were GORGEOUS. I'd totally recommend trying to get a riverview room on your stay. It's not guaranteed you'll get one, but hey, it doesn't hurt to ask! Because we were staying on-property, we took advantage of the restaurants that are available within Walt Disney World - safe to say we were by no means restricted! There are dozens (maybe hundreds?) of restaurants of all types around the World for you to try. We ate a few times at the Sassagoula Floatworks and Food Factory, which is the quick-service on French Quarter property. I actually really enjoyed it! They had quite a different menu than typical quick-services because some of it was Cajun inspired and it was delicious (try the beignets!! you won't regret it). We also tried out for the first time the Mobile Ordering at D-Luxe Burger in Disney Springs. It was super efficient and so easy to use! All we had to do was place our order on the app beforehand, click a button to let them know we'd arrived, and grab a buzzer at the restaurant to place on our table. We took a seat on the back patio, listened to some live music while we waited, and within minutes, someone was bringing our food over! Sure beats waiting in the massive line to order and wait for food to be made. I'll definitely be using that feature again and I highly recommend trying it! And, of course, no trip to Disney would be complete without brunch at the Grand Floridian Cafe! If you know anything about me, you know how much I adore the Grand Floridian resort. I've decided I won't stay there until my wedding (dramatic af, I know) so I've got to get my fix somehow. And that's by having the delicious brunch at the Cafe. I always order the traditional eggs benedict and it's wonderful! This trip was extremely special for me as we were there to celebrate my twentieth birthday! We spent the evening of my bday at the Magic Kingdom, where we did the Happily Ever After Fireworks Dessert Party. I did the Party last year for the first time with my bf and it was such an incredible experience that we decided to do it again for my bday. The Dessert Party is so much fun - there are a ton of sweets and goodies to try and best of all, you get prime viewing for the fireworks. We had a space of the hub grass to ourselves to just sit down, spread out, and relax while we waited for the fireworks - and even got to stay seated during the show. I'm spoiled forever and now standing during the show like a sardine in the crowds will never be the same! Easily one of my favourite moments of the trip, however, was my date night with my boyfriend. The two of us went over to Epcot, as we had a dinner reservation at Les Chefs de France. If you've ever been to Epcot, you've probably walked right past this place. It's that beautiful brasserie at the edge of the France pavilion, with the expansive windows and glistening rooftop. We both ordered the boeuf bourguignon and it was TO DIE FOR!! I've tried this dish before at the International Food and Wine Festival but it was even better in the restaurant. We had a delicious meal with an incredible server (shoutout to Kevin!) and then ended our perfectly romantic evening off with a stroll around the park beneath the sunset! On our first trip to Port Orleans as a couple last year, my bf and I decided to do a little resort hopping to see what the other resorts had to offer. When else will you get the chance to do it? This time, we brought along my parents to join us! We checked out Port Orleans Riverside and my personal fav, Old Key West. Riverside was so so beautiful and I thought it was quite cool how they had two different areas (my bf loved the Alligator Bayou area) but honestly it was too big for me and I can't see myself choosing it over my one true love, French Quarter! Old Key West, on the other hand, is a dream stay of mine. I def want to stay there someday (next summer perhaps?) and think it's just the greatest. I've always had a soft spot for Key West, FL and I think this resort really nails it. What's In My Disney Theme Park Bag? Packing a bag for a day at the Disney theme parks can be a pretty daunting task. But over the years, I've brought it down to a few simple things that I always have to have on me when I'm headed to parks! Today I thought I'd go through the staples of what I pack for a day at the parks, especially as I've got a WDW staycation coming up very very soon and I'm getting into the Disney spirit! First and foremost, I always make sure to have my wallet on me. You always want to make sure to have your Credit/Debit cards and some US currency. I also will have my Disney annual pass for parking and discounts, and my Starbucks Rewards card for if I want to get a coffee while I'm at Disney! I always keep lip balm on me no matter what, as I have dry and chapped lips. But if you know anything about me, you probably know I always have a lipstick on me too. At Disney, I usually carry my Revlon Ultra HD Matte Lip Colour in Seduction as it's a very neutral pink. Because I have prescription glasses, I make sure to bring them along with me as I never know when I'll need those - for driving or for rides. I also ALWAYS bring along sunglasses because it is the Sunshine State after all. Protect your eyes y'all! As Disney is a theme park and many people pass through, I always have hand sanitizer on me and make sure to use it whenever I'm about to eat. I also bring an assortment of basic meds with me, like Aleve, Midol, and Pepcid for emergencies. Of course, I always have to bring my keys with me to the parks. How else will I get home?! My keys fit in perfectly at the parks as they're very Disney-fied - I've got a Minnie keychain (my bf has the matching Mickey) and a rose gold Cinderella castle keychain! Be warned: Disney World does NOT sell gum! This is a long-standing tradition, to deter people from leaving gum all over the ground and messing with the parks. If you always like to have gum, like me, bring your own and be courteous please! Although this isn't technically inside my park bag, I always bring a Magicband with me. It's become a total life saver for me these past few years. I always use it for park entrance and Fastpass returns. Of course, I have to bring along my ears!! Where would I be without these bad boys? I have a whole collection of ears that I alternate between, but you can almost always guarantee that there's a pair in my bag or on my head! If I'm in the parks for a long time, like a full day, I'll use this Minnie Mouse backpack from Disney instead of my purse - it just disperses weight better on my back and shoulders, and is easier to tote around for long periods of time. What do you pack in your Disney park bag? Welcome to Epcot, World Travellers! This park has had a very special place in my heart for many many years although it wasn't always that way. When I was a little girl, my parents and I only popped into Epcot for short visits to go to the Akershus Royal Banquet Hall for the princess breakfast and then leave. Can you believe it? Little did we know we were missing out on a whole 'world' of fun (pun intended haha). One of the best parts of Epcot, hands down, is the World Showcase. The World Showcase takes up about half the park's estate and is made up of eleven countries. It's educational but not boring in the least. There is so much to do! But did you know that the World Showcase has it's fair share of secrets? Here are five fun facts about the World Showcase! The annual Epcot International Food and Wine Festival is a huge event for foodies. With over 70 days and 35 marketplaces, there is definitely no shortage of opportunities for delicious food tasting. But the most shocking part of it all is the sheer size of the event. It's so huge, in fact, that during festival season, the park sells over 30,000 bottles of wine and over a million plates of food! That's a whole lotta food. You won't be leaving the park hungry, that's for sure. Imagineers have been known to use forced perspective throughout the theme parks to make certain structures appear bigger to parkgoers, most notably Cinderella's Castle in the Magic Kingdom. But did you know that they also use it to make things look smaller? Imagineers wanted the American Adventure pavilion to be seen across the World Showcase lagoon, so they made the building a whopping 5 stories. However, to be historically accurate, they had to make it look 3 stories to coincide with the buildings in that era. So, everything is doubled in size - the windows are longer and the doors are taller! During the nighttime fireworks spectacular, IllumiNations, the pavilions light up the night as part of the spectacle. However, a keen eye may notice that Morocco doesn't light up. The reasoning behind their exception is that the main tower of the pavilion is made to replicate a prayer tower and lighting up the prayer tower would go against the Muslim beliefs of many Moroccan people. Disney didn't want to disrespect their culture and religion, so they chose to keep the pavilion dark during the show. There are actually a couple interesting things to note about Epcot's Eiffel Tower replica. The Eiffel Tower in the France pavilion is one tenth of the real deal. It's also a different colour than the Eiffel Tower we know today. The Tower in Epcot is a pinkish shade and the reason is that's the shade it would have been when it was first created. The pavilion is meant to represent the late 1800s, an era known as 'La Belle Epoque', which is when the Eiffel Tower was first erected. Take a closer look at the buildings in the United Kingdom pavilion next time you're at Epcot. You'll notice that as you pass by the shops, going further into the pavilion, you're actually 'walking through time', starting with the Tea Caddy which is meant to replicate the home of William Shakespeare's wife, Anne Hathaway. From there, you pass onto two shops built in 18th and 19th century styles, respectively. It's just another one of those special details that Disney makes sure to include in the park's architecture! Which of Epcot's little secrets is your favourite? I'm ready for my close-up! It's time for my Hollywood Studios must-do's. Although Hollywood Studios is in a bit of a transition period right now, there are still a bunch of fun things that you should see and do at this park. From walking the bustling streets of Hollywood to stepping into the exciting worlds of your favourite movies, there's adventure at every corner! Take a million pictures. This may seem very basic, but trust me when I say that Hollywood Studios is one of the most aesthetically pleasing parks in Walt Disney World. With the Chinese Theatre facade, the Tower of Terror, and basically just Hollywood Boulevard in general, there is no limit to the photo ops in this park. Some of my personal favourite photos to take are of Tower of Terror and Echo Lake, especially if there's an incredible sunset above! Go on a shopping spree. Hollywood Studios has arguably the best shopping of all the Disney World parks. On your next trip, I'd definitely recommend taking a stroll through the shops lining Hollywood Blvd and Sunset Blvd. They've got such a wide selection of Disney merch, including some Hollywood Studios specific merch and a ton of cute apparel. If you're looking for Pixar merchandise or an addition to your Dooney and Burke collection (a girl can dream, can't she? ), then this is the place to be! It's also worth mentioning that the outsides of the shops are extremelyyy cute! Step into Andy's backyard at Toy Story Land. Of course, I have to mention the newest addition to the Walt Disney World parks - Toy Story Land!! Coming off of the excitement of the Pandora opening last year, this land boasts two new rides, as well as a revamped Toy Story Mania. If you grew up in the 90s, you won't want to miss this. I recently gave a little review of my first impressions of the new land when I visited awhile back, which you can read here. The number one must-do here has to be the Slinky Dog Dash family coaster which looks incredibly fun and I cannot wait to give it a go when the lines aren't ridiculously long. Have a meal at 50s Prime Time Cafe. Keep your elbows off the table! The 50s Prime Time Cafe is the perfect burst of nostalgia and a great diner for some family fun. The whole place is set up like a stereotypical family's home kitchen in the 1950s, decorated right down to the most specific details, and they are very strict on making sure you mind your manners! All in all, it's an interactive restaurant fun for the whole family. Watch Star Wars: A Galactic Spectacular Fireworks. Callin' all my Star Wars fans, this one is for you! The Star Wars fireworks at Hollywood Studios are sooo amazing. The way they incorporate fireworks, lasers, projections, and pyrotechnics is pretty phenomenal - plus they do a really good job of uniting the characters from the original trilogy, the prequels, and the recent films together seamlessly. And if you think Ewan McGregor is as perfect as I think he is (*swoon*) then you'll be thrilled to hear that he has quite a lot of face time in the show!! What are your Hollywood Studios must-do's? Walt Disney himself once said, "Disneyland will never be completed. It will continue to grow as long as there is imagination left in the world." He knew that in order to keep visitors enjoying the parks for generations to come, they'd have to constantly update what was inside them. And although he wasn't present for much of it's lifetime, the very same idea has been carried over to Walt Disney World also. But there isn't an unlimited amount of space in the world and unfortunately that means that by updating the parks, some attractions have to be retired or removed to make way for new ones. Of course, Disney is constantly coming up with exciting new rides - but there will still always be a bit of me that misses some of the older attractions that have been removed. So today, let's take a trip down memory lane and chat about some of the attractions that are now gone that I once loved! I always loved this ride so so much when I was a little girl, even though it slightly terrified me a bit. Snow White's Scary Adventures was a dark ride in Fantasyland at Disney World's Magic Kingdom. It travelled through the story of Snow White, with her meeting the seven dwarfs and the Evil Queen. This was one of the remaining opening day rides at the Magic Kingdom, meaning that it was a ride that had been in open since the first day of park operation in 1971 - although, in 1994, the ride was modified to be less frightening for children as the original ride was pretty terrifying (allegedly!). I used to go on this ride all the time, every time I visited the park. One of my favourite park memories was boarding this ride with my mum while the fireworks were going on, as there was virtually zero line at all and we got on right away. It was so much fun and we could see the fireworks from where we boarded the ride. Sadly, the ride closed down in 2012 to prepare for the New Fantasyland. It was soon after replaced by the Princess Fairytale Hall. Oh, my beloved Great Movie Ride. I've loved this ride for many, many years. I loved how this ride really tied in with that old Hollywood feel of the park, especially with it being in the Chinese Theatre replica. I'm a huge film nerd so being able to ride through the movies, even if they were a little bit tacky-looking, was so cool to me. Every time I saw that Casablanca scene with Ingrid Bergman and Humphrey Bogart, I was in heaven. And at the very end of the ride, seeing that incredible movie clip montage sealed the deal for me because I have a weird obsession with movie quotes?? It's strange, but I know thousands of famous movie quotes so that sorta thing is so up my alley. Riding it for the last time last August was actually the most devastating thing ever. I'm interested to see the ride they replace this with but, let's be honest - I'm going to be bitter over this for awhile. Sigh. The Osborne Family Spectacle of Dancing Lights (phew what a mouthful) was a wonderful experience and one of my family's favourite Christmas traditions. I could go on and on about why they shouldn't have gotten rid of this, but instead I'll hark back to the good ol' days without the resentment. The Spectacle started back in Little Rock, Arkansas with the Osborne family themselves - the father, Jennings, owned a large estate and created a huge Christmas light display which eventually spread to the two properties on either side of their original home. Eventually, Disney approached the Osborne family, asking to set up their display on Residential Street in the then Disney-MGM Studios. By 1995, it was a part of what's now Hollywood Studios and the rest is history. The Osborne Family Spectacle of Dancing Lights was honestly so much fun, and I could spend hours and hours walking around there. This parade music would be stuck in your head for days but God, was it worth it!! There's nothing that upsets me more than the fact that Disney took away the MSEP but never replaced it. I miss having that nighttime parade experience so so so much. Here's hoping that someday very soon they're going to put in a new parade! (*fingers crossed*). This parade had magic to it, that's for sure. I always loved seeing The Jolly Roger come down Main Street, with Peter Pan and Captain Hook fighting it out on board. It was such a fun time and I'm so sad that it's gone away. Of course, I had to end this list off with quite possibly the most painful departure of any Disney attraction: Wishes. Wishes was the very first Disney fireworks show that I ever saw when I was 6 years old. And it was my favourite until it went away in spring 2017. On every trip to Disney, I saw Wishes at least once. I saw it from all over the park too: from Tomorrowland, from on Big Thunder Mountain, from the queue of Seven Dwarfs Mine Train. It was such a magical, meaningful show and watching it brought back so much nostalgia from my childhood for me. In 2017, Wishes sadly went away. It was a big moment for my family honestly!! Unfortunately, because they hadn't given a lot of forewarning that it was being replaced, we weren't able to go to the parks to see the last showing of Wishes, but we did watch the Facebook livestream. It had been a part of the Magic Kingdom for a whopping thirteen and a half years. And all of a sudden, it was gone! Fortunately, the replacement, Happily Ever After, is incredible and so, so good. But a part of my heart is always going to miss Wishes and all it stood for. What is your favourite 'lost' Disney attraction? Over the years, I've garnered myself quite the Disney pin collection. Ever since I was a little girl visiting the parks for the first time, I've periodically found myself at the pin section of any Disney World shop, scouring the racks for new pins which ultimately led to a major collection. If you aren't a Disney parkgoer, this might seem like the definition of insanity to you - but if you've ever been to the parks, I'm sure you know firsthand the Disney pin craze. Today, I thought that I'd share a few tips for Disney pin collecting with you guys in case you're thinking of starting your very own collection! Pin trading has become a pretty common thing in the last few years. It's more popular among kids, but teens and adults can totally jump into the fun, too! Cast members typically walk around the parks wearing lanyards with a number of pins on them. They can trade any of their pins (aside from a couple they have, like their personalized tag) with guests and that gives you an opportunity to get ahold of some really cool, rare pins! As much as pin trading can be fun, there may be specific pins you're looking for that may not show up in the pin rotation that you're dying to get your hands on. Most stores will have a pin section in them, like the Main Street Emporium at Magic Kingdom - however, there are also stores in the parks where pins are the main focus. Once upon a time, there was a big giant Sorcerer's Hat in Hollywood Studios that held the best collection of pins! Nowadays, some of my favourite pin stores are the Disney's Pin Traders at Disney Springs Marketplace and the Frontierland Trading Post at Magic Kingdom's Frontierland. In the past few years, Walt Disney World has been making major adjustments, renovations, and improvements to the parks which has resulted in a number of rides and attractions being demolished or replaced. Although I'm lucky enough to have purchased pins of some of those rides before they were removed, I don't have all of them - especially Great Movie Ride, which was my favourite but I never found a pin for. So, now that I've learned from my mistakes, I've started looking out for pins of my fav rides to buy as keepsakes, should they ever remove them, and I'm here to advise you to do the same! You can never know for sure with a park like Disney, that's always improving, if your favourites will still be intact come time for your next trip. It's always safe to be prepared. Plus, now you'll have a sick collection of pins from your fav rides!! Disney currently sells quite a few options when it comes to mystery pin packs. These little bad boys are baggies full of pins, and you won't know what's inside until you purchase and open the pack. This makes it a big, fun surprise when you finally do get to open up the bag and see what you've got out of it - you might just have a very rare or special pin on your hands! It's also great for pin trading, as you're likely to end up with a couple pins that you're not particularly fond of but that someone else might be looking for. The same goes for the 'starter packs' that are available which come themed as Princesses or Star Wars, where you get a number of pins from that genre or film which gives you a wider selection to choose from. This might just be the best part of the post. Obviously, once you've returned from your Disney vacation with all your marvellous new pins, you're gonna want to show them off! The best way to do this is by finding a way to display them in your home. If you only want to show off a few of your favourite pins, you can always use a Disney lanyard - which you can buy from the parks - to display them and hang your lanyard somewhere in your room. Or, you can go with a cork-board, which is what I chose to do. A few years back, for my high school graduation, my boyfriend's parents bought me a heart-shaped cork-board (pictured above). I ended up bringing it to Florida to hang up in my bedroom here and decorate it with all my favourite pins. A cork-board is perfect because it easily keeps pins in place - all you have to do is take the backing off your pin and shove it right in - and it also gives you lots of space for displaying pins! Although I can't fit all my pins on my board (to be fair, I have several dozen pins), it does give me ample room for the pins that I consider my favourites that I want others to see. Do you collect pins? Which are your favourites? The wait is over! Toy Story Land has officially opened at Disney's Hollywood Studios. After what seemed like ages of waiting, I finally got my first peek inside this magical new area recently and today, I thought I'd share my thoughts and my experience with you guys! As a late 90s kid, the Toy Story films were huge when I was a kid. Growing up, they were a constant part of my movie line-up and the same goes for my boyfriend, who loves the movies even more than I do. So the fact that we can now walk into this world of toys is so incredibly cool! My family, my boyfriend, and I decided to make our first trip out to Toy Story Land in the late afternoon, so that we would get to see the land in the daytime as well as the nighttime, to get the whole experience. We had a FastPass for Toy Story Mania at 9:15pm, which was literally the only ride that we were able to get FastPass for. Being able to see the park in the daytime was incredible because the details that the Imagineers included in this area are so well thought out and not to be missed. The whole concept of the land is that you're supposed to be shrunk down to toy-size, running around Andy's backyard with his other toys. And the Imagineers did an incredible job with keeping to the theme. Every small feature works together to add to the experience. Jumbo-sized toys and other nostalgic 90s memorabilia are scattered around the park, even sometimes used as benches or other structures which is so cool. Everywhere you turn, there's something new to look at - and it's all amazing. The area has two new rides - Slinky Dog Dash and Alien Swirling Saucers - in addition to the already popular Toy Story Mania. Personally, the Slinky Dog Dash looks a little bit more up my alley, as it's a proper family roller coaster with not-too-big drops but high-speed turns and other thrills - whereas the Alien Swirling Saucers is more of a Mad Tea Party spinning ride which I'm not a huge fan of. Unfortunately though, neither of the new rides had any FastPasses available and the standby queues were quite lengthy, so we didn't get to try them out this time, but I'll definitely report back when I do! We did however get to ride Toy Story Mania which, although not completely new, has been altered to work better with the new land. The entrance has been moved from Pixar Place to Toy Story Land and the ride now has a new outdoor-indoor queue that fits perfectly with it's surroundings. What might just be the best part of Toy Story Land though is the photo opportunities around the area. I've gotta say, it's one of the most photogenic areas in Hollywood Studios - which is saying a lot, because Hollywood Studios is a great park for taking photos! As I said before, there is no area brushed over in this park. Everything is meticulously crafted and created to match the movies and theming of the area. Even better, actual Toy Story characters like Buzz Lightyear, Woody and Jessie all walk around the park so you can take photos with them! The area is so spacious and well laid out in that the rides are kind of situated further back in the area so the queues don't make the main portion of the land congested. Also, I've heard that the queues are full of fun surprises and nods to the movies. There's also a ton of viewing areas of the rides so that you can still see them in motion as you cry over not getting a FastPass, haha! All in all, Toy Story Land is so much fun and it's a great new addition to Hollywood Studios! And if this is any indication of what Galaxy's Edge will be, then we have a lot to look forward to! Have you guys been to Toy Story Land yet? Do you plan on going? When I was younger, I was never really big on Epcot. It didn't really have a lot to offer for a six-year-old, so my family kind of just looked past it on the first few visits. But, as I got older, I started to realize the charm - and beauty - of Epcot and now it's become my favourite park in all of Walt Disney World. No visit to the parks is complete without a trip to Epcot. In fact, most trips, I visit Epcot more than once! I love all this park stands for and there is so much that it offers for guests. Here are my Epcot must-do's for a Disney vacation! Ride Spaceship Earth. This is unequivocally the number one must-do at Epcot for me. Spaceship Earth is easily my fav Disney World attraction (ever since they retired my beloved Great Movie Ride #rip). There's nothing I love more than plopping down in my backwards-and-forwards moving Time Machine and going for a spin through history with my bff Dame Judi Dench. This gem is quite literally located inside that beautiful geodesic sphere at centre stage in the park - it's what you probably know as the giant golf ball. My dad fondly refers to this as a 'good nap ride' but don't let that fool you! It's great. Trust me. Have a bite to eat at Les Halles Boulangerie Patisserie in France pavilion. The France pavilion has many incredible places to eat. But my personal favourite quick-service meal in Epcot actually resides in the back of the France pavilion, at Les Halles Boulangerie Patisserie. This little bistro-style quick service is constantly packed with hungry parkgoers but never fear, the line is quick moving and WORTH. IT. I actually dream about the Croissant Jambon Fromage, which is ham, cheese, and bechamel inside a croissant. Yummmm!! Pop into Mouse Gears. Oh, look, a Disney shop. Are you surprised? Probably not. This is one of the bigger shops in the parks and it's got a ton of stuff to browse through. Along with the typical sections - adult apparel, children's apparel, toys, stationary, books, movies, candy, homeware, etc. - it also has a great Epcot-themed area where they've been selling Epcot 35th Anniversary merch for the past year. 90% of my Disney merch collection has been purchased at Mouse Gears. It's not a trip to Epcot unless I've spent 15 minutes standing in the homeware section of this shop, trying to convince my boyfriend that we need another Disney mug. Visit my home country. Of course, I have to visit the Canada pavilion whenever I take a trip out to Epcot. It's my duty as a Canadian! But no, in all seriousness, I always try to make a quick stop at the Canadian pavilion, as it's lovely to see what sort of merch they've got in there and it's always nice to have a chat with the cast members (all the cast members in each pavilion are native to that country). Once, we went in and spoke a CM who was from our old neighbourhood! They also have a book where you can sign your name and what province you come from. We've been doing it for years and it's always fun to see where the other visitors are traveling from! Take a trip around the world. I think I'd be remiss if I didn't list taking a stroll around World Showcase as one of my must-do's. It's so cool to see all the different countries represented and to be able to experience some of what each of the countries has to offer. I love poking around in each of the pavilions just to see what's been recently added and also to admire the beautiful areas. There are some serious photo ops for any photography lovers, or just anyone looking for a good selfie spot! Some of my favourite places to take photos are Canada (that's where the picture above is from! ), France, Morocco, and United Kingdom. I always like to look for the less-travelled path and see where it takes me - and what photos ops it offers! What are your Epcot must-do's? So as you probably already know by following my blog and Insta, I'm majorly into Disney. Shocker, right? I've been visiting the park for awhile now and I feel like I've gotten pretty comfortable with the whole planning process. In fact, a lot of people I know message me to ask for tips on booking their own trips to the parks. So, I thought it might be fun and helpful to post a how-to on the planning process. Fair warning: there's a lot to cover, so this post is going to be pretty meaty and lengthy. The first thing you'll want to do before taking any steps in the planning process is become acquainted with all the Walt Disney World has to offer. I'll try my best to keep this short and sweet! Walt Disney World is comprised of 4 major theme parks: Magic Kingdom, Epcot, Hollywood Studios, and Animal Kingdom. With a base ticket (more on that later), you can enter any one of these four parks. This is where all the rides, characters, and general excitement is, so you'll definitely want to take time to explore each park! They also have two on-site water parks, Blizzard Beach and Typhoon Lagoon. These are not accessible with a base ticket, so be wary of that. Both are equipped with water slides (tame and thrilling), pools, and lazy rivers. Another key feature of WDW is their massive dining and entertainment complex, Disney Springs. Originally Downtown Disney, in the past few years, it's undergone a huge reimagining and has become one of my favourite places in the Walt Disney World resort. It's jam-packed with amazing restaurants, bars, stores, live entertainment, bowling, movie theatres, and so much more. You could never get bored there! Disney also has a number of other entertainment features, such as mini-golf, golf, boating, horseback riding, water sports, and the ESPN Wide World of Sports. As you can probably imagine, Disney World can get hella busy. You've essentially got two options, as there are two "seasons": busy season and off-season. Busy season has the heavier crowds and primarily consists of the days or weeks that sit around major holidays. Columbus Day, U.S. Thanksgiving, Spring Break, Easter, Christmas, New Years' and July 4th are all extremely busy times to visit the parks. At these times, you can expect wait times from 50 to 100+ minutes, depending on the popularity of a ride. Also, the parks are generally more crowded. Don't fret! There is also an off-season. Basically, in the off-season, you can expect less of a wait on rides (usually 20 to 50 minutes, sometimes higher) and it's far less crowded around the parks. The best times to go if you're looking for lighter crowds are the end of August to mid-September (as the kids will have gone back to school in Florida and most of the U.S.) and May. You can easily find crowd charts for the parks in a quick Google search, but I'll link one down below as well! It's also worth factoring in the weather when making a decision. Summer is the craziest time for weather; it is extremely hot (I'm talking 90-110 degrees F) and also the end of the summer is hurricane season, which makes for lots of rainy days. 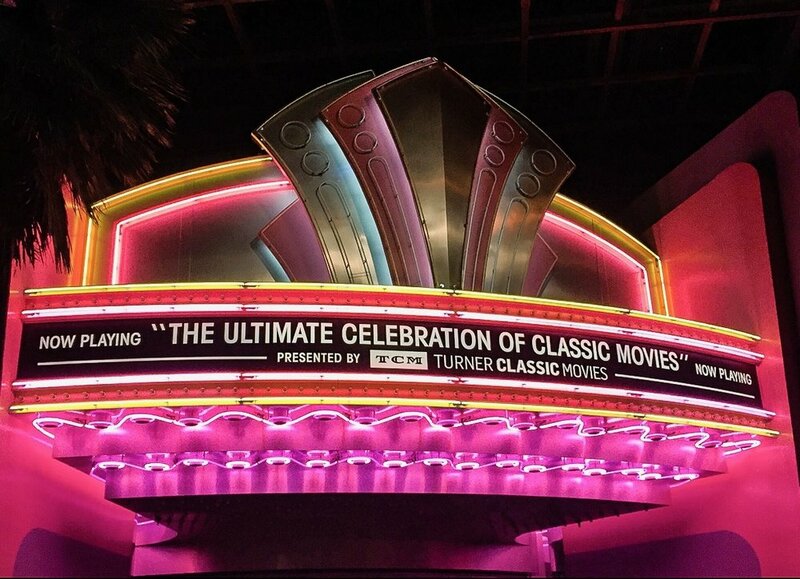 A bonus of attending the parks during busy season is that you have the chance to experience some really awesome special events that Disney hosts. There are two types of these events: free festivals and ticketed events. The three major free festivals for parkgoers are held at Epcot annually. The first is the International Festival of the Arts (January - February), which is a newer festival that showcases the work of Disney artists around the park and also celebrates many famous paintings from different countries. The second is the International Flower and Garden Festival (February - May) which boasts a number of topiaries featuring classic Disney characters and it is utterly beautiful. They also feature many outdoor kitchens which offer delicious food and beverages! And last but not least is the International Food and Wine Festival (August - November) which is a celebration of different cultural dishes from around the world. The food is phenomenal and not to be missed. There are two major ticketed events held in Walt Disney World. Ticketed events require visitors to purchase an additional ticket outside of the park entrance ticket. These extra tickets allow you into the parks for these events which take place after regular park hours - they close the park early on select nights for the people partaking in the event. These two major ticketed events are Mickey's Not So Scary Halloween Party and Mickey's Very Merry Christmas Party. Both are held at the Magic Kingdom on select nights throughout the holiday seasons. They're both really awesome, as they have their own special fireworks, parades, and nighttime shows. And the Not So Scary Halloween Party even has trick-or-treating! How cool is that?? This is a pretty big decision for anyone visiting the parks. I'll just run through some basic things to note when you're deciding on whether to stay on- or off-property. Staying on-property means staying in any one of the Walt Disney World resort hotels. These hotels are organized into three tiers: value, moderate, and deluxe (with value being the cheapest, and deluxe being the priciest). Staying on-property is inarguably the most convenient option, as the hotels are literally minutes away from the theme parks and they offer free transportation to all the on-property venues. Also, they offer free transportation to and from the Orlando International Airport, which is a huge bonus. You also get some extra magic by staying on-property, like having the option to add a Disney Dining Plan, attend park Extra Magic Hours, and book FastPasses 60 days in advance. Of course, all of that will cost you - it gets pretty pricey, especially adding on top of that the cost of flights and park tickets. With off-property, you obviously lose the accessibility, but with that you shave off some of the cost as well. There are literally hundreds of hotel options in Central Florida with many different ranges in pricing, especially in the touristy International Drive area. If you're planning on doing a few days at Disney but also spending some time at the other attractions in Orlando, then staying on International Drive would be beneficial as it's right in the middle of it all. You can also stay in a vacation home rental which is great for big families and groups that want to stay together without paying the cost of a Disney suite or villa. However, you do still have to factor in travel time (it's a bit of a jaunt from Disney), car rental prices, and parking fees (at Disney alone, you'll be paying $22 to park per day). The lowest level of park ticket you can purchase is the Magic Your Way Base ticket. It is literally a basic entrance ticket, meaning that you can enter one of the four theme parks at a time for the set number of days on the ticket. For example, if you visit Magic Kingdom on the first day of your trip, you can come and go as you please, but you cannot travel to another theme park on that same day. Just Magic Kingdom. This is the most inexpensive option, for that reason. In order to visit another park on the same day, you'll need to purchase a Magic Your Way Park Hopper option. This is an add-on to the base ticket which allows you to go from one park to another in the same day. For instance, if you start your day off at Magic Kingdom and then decide midday to go to Epcot, you can do that. You can even visit all four parks in one day, if you're up for the challenge! But of course, it will cost you more. Additionally, you can add on the Water Parks Fun and More option, which also allows you to visit Typhoon Lagoon and Blizzard Beach. This also use to include Disney Quest, but that no longer exists! Lastly, you can purchase a Walt Disney World annual pass. There are two options, Disney Platinum Plus Pass and Disney Platinum Pass. The main difference is that the Plus allows you entrance to the golf course, the water parks, and the ESPN Wide World of Sports in addition to the four theme parks, whereas the regular pass only allows you to go to the theme parks. Both give you discounts on select dining and merch. If this is your first visit to WDW and you plan on only visit the Disney parks, I'd suggest staying for anywhere between five to seven days. It sounds like a very long time, but there is so much to see and do at Disney that you'll be grateful for it. Plus, it allows you to see everything at your own speed and eliminate that rushed feeling. It's also good for if you want to see things outside of the WDW resort, like Universal Studios Orlando or Cocoa Beach (which is about an hour out from Disney). What is a FastPass, you might ask? Well, lemme tell you. (That was so cheesy haha). FastPasses are free tickets that you can get that essentially allow you to virtually reserve a place in line for rides. You just pick a ride and a time (they work in hour-long increments), then schedule it. When your time comes, you just pop over to the ride and jump into the FastPass line. For example, if you've booked a 5 o'clock FastPass for Jungle Cruise, you can get in the FastPass line for Jungle Cruise at any point between 5 and 6 o'clock. The FastPass lines are generally shorter and quicker than the standby lines. You're given three FastPass selections for the day BUT once you've used them up, or your last FastPass for the day has expired, you can book one at a time in that same day. Pretty cool, right? It makes getting on more popular rides like Flight of Passage so much easier. You can book these online or on the My Disney Experience app 30 or 60 days in advance (depending on whether you're staying on-property) or at the in-park kiosks. But FastPasses go quick, so make sure to do this asap! These are two fairly new additions to the parks in the last few years and they've become pretty much integral to the WDW experience, so I'll quickly explain them both. MagicBands have become the new way of entering and getting around the Disney parks. Your pass is linked to this rubber wristband, which means you can enter the park by tapping your band to a reader and placing your finger on a fingerprint scanner. It's so much easier than fumbling with your wallet to get a card out. They also can be used to present your FastPass by tapping a reader at the rides, as it's linked to your My Disney Experience app. 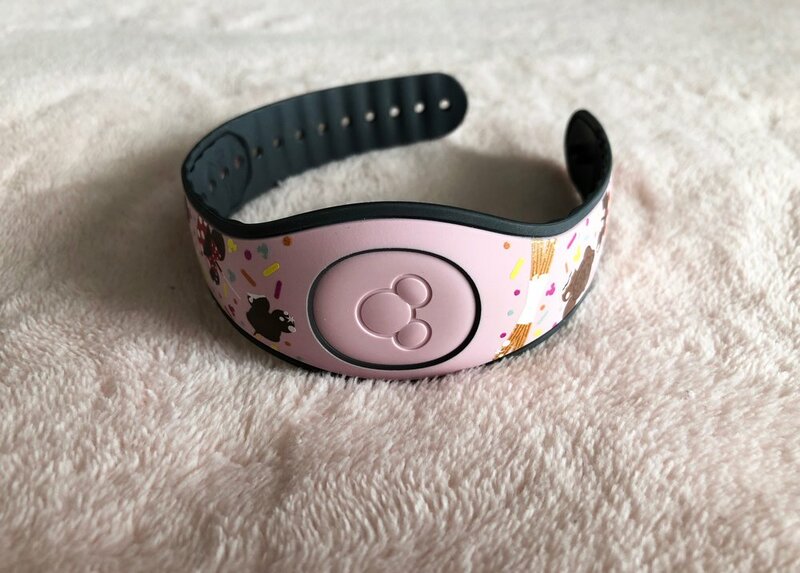 For on-property guests, you can also link your credit card to the MagicBand to make paying for dining and merch a breeze. This is an app that you can download onto your phone and use in the parks with the free Disney World wifi connection. It has everything you could ever imagine on it - park maps, ride wait times, FastPasses, dining reservations, room check-ins, park passes, and more. It's like a tool kit for your stay in the parks. Personally, I'd highly recommend getting it before you travel to the parks as it'll make your life so much simpler. Well, that's all for now! If you're still a bit lost or looking for more info, you can follow these useful links for more explanations. I hope you guys found this post helpful. Thanks for reading! Disney, as you already may have noticed, is hugely important to me. Growing up, not only did I frequently visit Disney World, but I was also a massive fan of the Disney animated films, as most of us were. I spent my childhood days hunkered down in front of my tube tv (remember those?) with one of my many Disney vhs tapes in the vcr. There was nothing I enjoyed more than hearing that static-y noise of the tv powering on and then having the Walt Disney Entertainment opening pop up on the screen. Even as an adult, Disney films are my favourite. I think there's nothing cosier than sitting down on the sofa with some treats and a big blanket, watching a good ol' Disney film. Today, I thought I'd share with you guys my top 10 favourite new and old animated Disney films! What are your favourite Disney animated films? "Don't you want to try something new for a change?" A lot of people just can't understand why my family wants to spend so much of our time in a place that was made for kids. We spend about four months in Orlando, per year, and we visit the parks at least 4 times a week. That's a whole lotta Disney. From the first time that I visited Disney, I was hooked. The minute I saw Cinderella's castle, that was pretty much it for me. For a little girl who dreamed of being a Disney princess, I was in my own personal heaven. On the last day of every trip, the ever-so-dramatic child I was, I used to stand on Main Street and cry because I literally could not imagine spending even a day away from Disney World. But what's so special about an amusement park? I hear you asking. At Disney, there are no boundaries between grown-ups and kids. I love that. Can you, as an adult, buy a Mickey-shaped balloon and then skip around the Magic Kingdom with an ice cream in your hand?? Hell yea, you can!! You can do whatever you want! The parks were actually made for everyone - not just for kids. The parks are constantly being improved and added to, to keep every trip interesting and it's like a different park every time. And all in all, it's like experiencing all the films from my childhood in real life. It couldn't get any cooler than that!! Back when my bf first came to Disney with my family in 2014 (peep those two throwback pics!! ), he was what you'd call a "casual Disney fan" - he'd been to the parks before but he didn't know too much about it and wouldn't consider himself a megafan or anything. But it didn't take long at all for him to get hooked. Four years later, he's an annual passholder and a friggin' Disney expert, I must say. 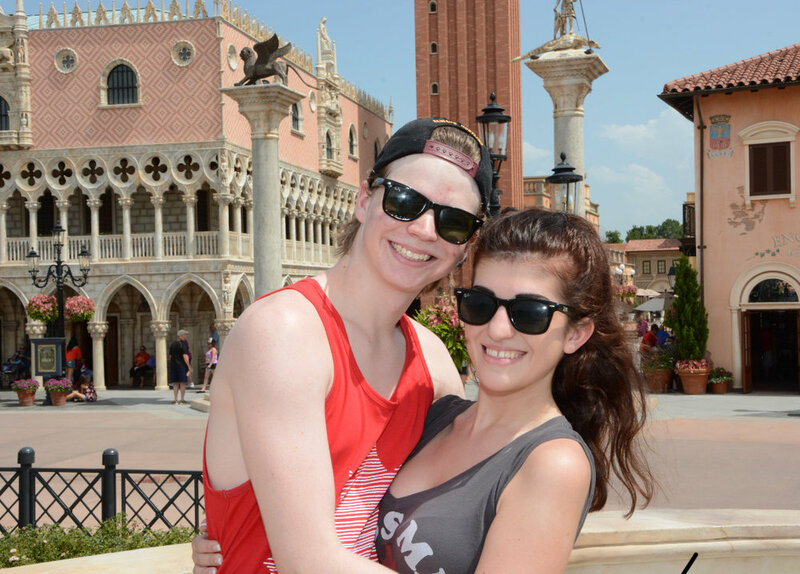 Visiting Disney has become such an important part of our lives together. And bonding over our love for the parks has honestly brought us so much closer in our relationship. I love that we can go to the parks and just be able to have fun together. So many of our greatest memories have happened in Disney. And whether it's running around the Magic Kingdom in Halloween costumes, or singing along with the fireworks music, or riding our fav rides - it's just so much more fun because we get to do it together! So why do I love Disney so much? It just never gets old, honestly. Like, no matter how many times I see the Happily Ever After fireworks, the part with the floating lanterns always makes me emotional. And the sight of Spaceship Earth at night is still photo-worthy after hundreds of visits and photos. I even still get that excited feeling in my stomach whenever I pull up to the Magic Kingdom station on the monorail. It doesn't matter how many times I go - the magic is always there for me. And it's so amazing to me that I get to see kids and adults see the magic for themselves for the first time. At the end of the day, in Disney World you can be whoever you want to be. You can be a kid, or a princess, or a superhero, or a pirate, or a galactic warrior. Disney is the place for dreaming and for releasing your imagination. As Jiminy Cricket says, "If your heart is in your dream, no request is too extreme." If you wanna keep up-to-date with my many Disney World shenanigans, you can follow my Disney Instagram here.